RAMUI WEBBLOG is a PHP-MYSQL based free blog script. Multi-language support: This script supports any UTF-8 language. AmitySource Userbar Generator is an easy-to-use program for generating unique and attractive userbars. With it you can create nice-looking userbars within five minutes and without any technical or artistical knowledge. A Free Windows Syslog message generator which sends Unix type Syslog messages to any PC or Unix Syslog Daemon. Excellent for testing your Kiwi Syslog Daemon setup. Supports TCP syslog messages for emulating PIX firewall messages. Typo generator is domains misspelling generator which helps you find misspells of high traffic domain names. Typo generator finds for you misspells: Skip Letter, Double Letters, Reverse Letters, Skip Spaces, Wrong key, Inserted key, PHONETIC KEY! The Password Strength Analyser and Generator is one application combining two tools - the analyser (shows the "strength" of your pass phrase regarding some rules) and the generator (generates a "strong" pass phrase regarding the same rules). .
Every week you need new lottery numbers. 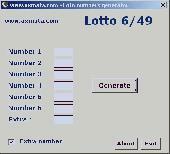 With Axmata Lotto numbers generator you can generate them with one click. 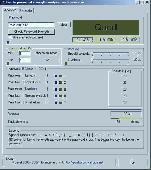 Our application is freeware. CalMAN HTPC Pattern Generator is a free software application that allows you to generate video test patterns from your PC. While HTPC integrates well with SpectraCal's display calibration application CalMAN, HTPC will also serve as a standalone application. A very simple random number generator for lottery / lotto games. Possibly the most random piece of software on the internet it will pick 6 numbers from a user defined range. Numbers can be distributed via email or WAP. . . Password Generator Pro is a tool that assists users generate easy-to-remember and secure passwords. This password generator generate strong, difficult to break random passwords with various length from 5 to 20 caracters.